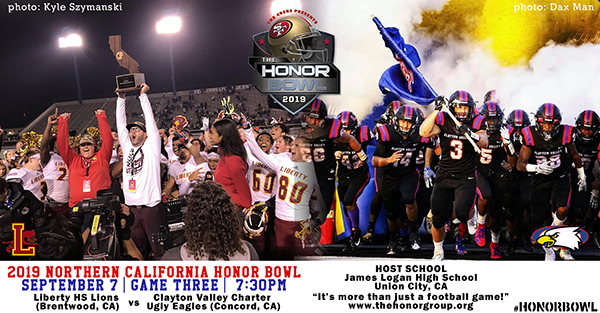 For the first time The Honor Bowl will be played in the San Francisco East Bay. 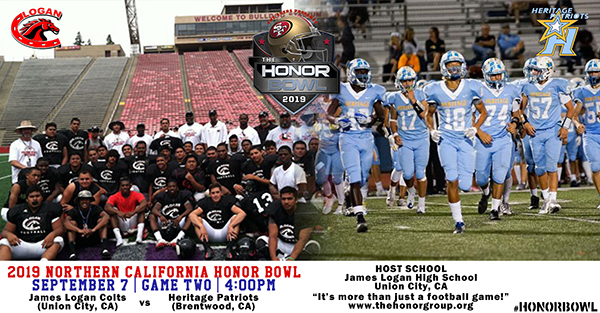 James Logan in Union City is excited to have this prestigious event at their school. 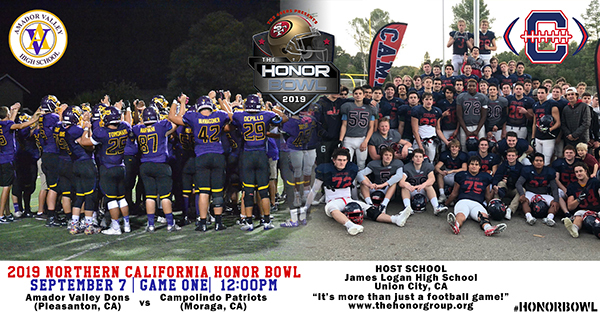 Game One of the 2019 Honor Bowl will pit two local teams that have never faced each other. Both Head Coaches Danny Jones of Amador Valley Dons and Kevin Macy of Campolindo Cougars jumped at the chance to be in the first East Bay Honor Bowl. The Dons of Pleasanton will field a relatively new team with a strong group of returners. The Cougars of Moraga are no stranger to tough games. Campolindo competes in the competitive Diablo-Foothill league. Both coaches understand the significance to be part of The Honor Bowl and welcome the opportunity to become more aware of the men and women who volunteer their lives to protect our freedoms. Game Two is another classic matchup that has two teams that love competing against a new opponent. James Logan Head Coach Rodriguez was adamant to be part of The Honor Bowl when he recently took over the Colt football program. Nice that in 2019 he is not only playing a game in The Honor Bowl but James Logan is also hosting the prestigious event. Heritage is the first of two football programs traveling from Brentwood to be in The Honor Bowl. Head Coach Don Sanders learned quickly that the Patriots are in The Honor Bowl. Brentwood is a strong military-centric community and we know the fans and followers will appreciate the festivities that surround The Honor Bowl. Here we go – the finale of the 2019 Honor Bowl and is this a great game! Liberty Lions Head Coach Ryan Partridge had a dream season in 2018 winning the CIF State D1-A championship. The Lions also competed in the first NorCal Bay Area Honor Bowl hosted by Saint Francis High School in Mountain View, CA. Liberty will have a strong returning team led by rising senior QB Jay Butterfield. Clayton Valley’s Head Coach Tim Murphy is no stranger to The Honor Bowl having competed in three other showcases. The Lions vs Ugly Eagles adds up to be a great way to have the first Honor Bowl complete the two-week showcase in 2019.